Lavender vinegar, saffron wafers, chicken baked with prunes, pears stewed with cucumbers and figs . . . there is something wonderfully inviting about the unusual and exotic flavors that came to the medieval Polish table. By turns robust and refined, and capturing all the richness and complexity of Poland in the Middle Ages, this is cookery that flourished at the crossroads of Western and Oriental foodways. 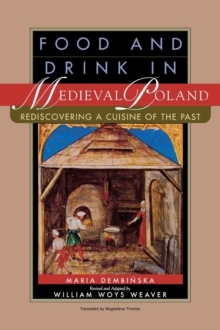 This is the first book of its kind in English to explore the fascinating culinary history of medieval Poland. It represents the fruits of a twenty-year collaboration between two distinguished food historians, William Woys Weaver and the late Maria Dembinska. Freely adapted from a pioneering work first published by Dembinska in 1963, this new edition explores the subject of Polish medieval cuisine through archaeology, material culture, and ethnography, along with other perspectives and techniques. Topics examined include not just the personal eating habits of kings, queens, and nobles but also those of the peasants, monks, and other social groups not generally considered in medieval food studies. To appreciate the tastes and textures of medieval Polish cookery, there is simply no better way than to experience the food firsthand. Weaver has included thirty-five carefully reconstructed recipes, from courtier's pottage, a one-pot dinner popular with rich peasants and petty nobles, to game stewed with sauerkraut, to a court dish of baked fruit, to Polish hydromel, an easily made drink flavored with honey and fennel. With ingredients such as rosewater, cucumbers, saffron, and honey, these recipes will intrigue anyone who loves the art of cooking. Pages: 256 pages, 40 illus.